Heritage Paddle Designs – I wood-burn unique designs onto canoe and kayak paddles. Canoe and Kayak decks are also my ‘canvases’. In fact, I will put a design on anything that is wood! Each commissioned design is a work of art – the result of consultation, research, and creative development and is based on the interests, experiences, passions or cultural heritage of the recipient. 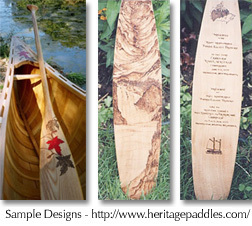 Heritage Paddle Design purchasers are individuals or groups seeking a unique gift for a special person, to celebrate occasions such as birthdays, anniversaries, marriages, graduations, contributions, retirements, achievements … or “just because”.